While I lollygagged around town yesterday and did some riding on the Silvio, I made up for it today. Did my longest ride on the Silvio to date...41 miles with a fair amount of climbing, too. I am beginning to feel like I'm part of the Silvio now. Climbing, while always difficult, was easier today. Partly, I know, because I'm getting into shape again. But, also, because I have incorporated some of the tips that I read on the Cruzbike Forum, which have helped immensely. The bike doesn't feel as unpredictable to me at this point. There are moments where I feel a bit tenuous on the Silvio, but I felt pretty good for 99% of the ride today. The tips that I read about regarding control while going downhill...push against the handlebars, the seatback...worked well. Much more stable descending hills. Got up to 40mph this morning. I could tell as I was headed back to town that I was getting tired, but, prior to that, I was moving right along on the bike and I felt good on it. Quite a big change just from a few weeks ago. As I put mileage on this bike, I'm certain that I'll become even more comfortable and capable on it. Like any bike, however, I need to be aware and never underestimate it. Remember Life Lesson #1: "Don't Be Stupid." Easy to say; hard to do. Yesterday, I also was able to mount a Salsa Everything Cage onto the bottom of the seat on the Silvio. I will put the other one on tomorrow. With these mounted under my seat, I can now bring my two Hydro Flask 40oz bottles with me when I do long rides, 80-100 milers. Invariably, no matter when I head out in the mornings, I end up riding during the hottest part of the day this time of the year, so the extra COLD water is much appreciated. These will come in handy for touring when I might need to carry some extra water for camping...or just to carry some gear for overnighters or short tours. I will review the Salsa Everything Cage after I've used it a few times. Yesterday, after getting it on the Silvio, I put the Hydro Flask in the cage, went for a ride down the street, and it worked well. My leg didn't hit it and it didn't rattle. 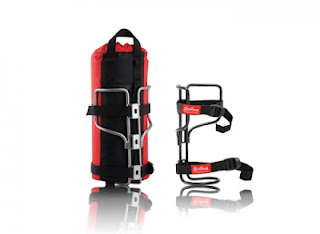 The straps on the Salsa Everything Cage allow for really tightening the Hydro Flask in the cage. So far; so good. Ok, another tune and I'm outta here. Trying to see how long it will be before Eileen reads my blog and notices these tunes I've been putting up in this post and the previous one I did yesterday. I'm counting....!